allegedly said "officers who graduated from American military schools were no better than dogs; that the government had cut the supply of sugar and cut off supply of booze to the army and said they would send the boys candy and they let a million tons of it rot in storage in New York and that treaties were nothing but scraps of paper and worthless; that we couldn't believe what we read in the paper, that the press of the U.S. is owned and controlled by Great Britian, that we would have to wait until after the war and get the news from both sides before we could decide which side was wrong; that stories of the barbaric practices in Belgium and France published in the paper were lies. Over in Germany they have the best county in the world. You get 3 marks a day–like $3. How cheap butter, eggs, and stuff was." The remarks were made at the Speckle Trout Mine. prison, entering on June 27, 1918, and leaving on April 13, 1919. The Powell County Post had this to say about his conviction: "Charles Hohrman, 55, Germany, Philipsburg, resident for 17 years but couldn't refrain from boosting Huns." Personal Information: Charles was born in Germany and immigrated to the United States in 1886. 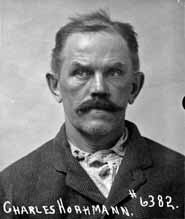 At the time of his conviction, Charles was working at the Speckle Trout Mine in Philipsburg. He also worked as a butcher. He was in the 3rd Cavalry of the 1st Priv. Volunteer Regiment from Wyoming, and served in the Philippines War. Charles is buried in Custer National Cemetery.